With new developments in Computer Technology coming out almost daily, home or business computers can quickly start to show their age with slow load times and poor performance. From processors to hard drives, STORMComponents can advise what upgrades are available for your computer and which would give the biggest 'bang for your buck'. Feel free to chat to me (Tom) via the Support Chat or call STORMComponents on 0330 6600 161 for more information. Increases your computer's 'thinking power'. Processors are what run your computer's operating system, programs and operations. Upgrading to a faster processor or one with multiple cores will let your computer complete tasks faster, or handle more operations at any one time. Will generally increase your computer's load times and responsiveness. RAM (Random-access Memory or just 'Memory') can read data much faster than hard drives, so when a program is running your computer will temporarily save important data to the RAM, allowing your computer to access it quickly. Increasing your computer's RAM capacity or speed can show significant load time reductions. Can increase your boot time, program loading time, system stability and of course, your storage capacity. With hard drives offering up to 4TB (4000GB) of storage per drive, a new drive could offer an incredible storage space for your films, music, pictures and downloads, and still have room left over! You could also look at upgrading to a faster hard drive, hybrid drive or SSD (Solid State Drive) to dramatically increase your system's loading times. Could allow your computer to play the latest games and high-definition video without issues. Graphics cards range in price from £30 to £3000 and there are literally thousands to pick from, so there's an upgrade for just about everyone. 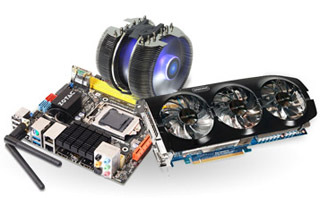 STORMComponents are experts in NVIDIA and ATI graphic card solutions, and can not only assist in finding a video card to best suit your needs, but can also advise on overclocking, cooling and SLI / Crossfire setups. Can increase your computer's stability, speed and hardware support. The number one issue that we at Storm run into is when a computer is so out of date that it's no longer worth simply upgrading the CPU or RAM due to the old architecture of the motherboard. In cases like this a new motherboard will allow the latest Processors, RAM, Graphics cards and Hard Drives to also be installed, giving huge performance increases to the user.